Domino’s pizza is one of the most popular pizzas in Singapore; many people love their signature pizza sauces, “Domino’s Signature Sauce made from fresh vine-repened tomatoes”, “Sweet 4 Spicy sauce for those who like a bit of spice in their life”, and “Top Secret sauce, an aromatic of creamy, cheesy flavors with an unmistakable garlic zest”! Domino’s pricing is all inclusive. No extra charges for delivery, ERP or GST. What you see is what you pay. There are four sizes available to choose for Domino’s Pizza: 6” personal pizza, 9” regular pizza, 12” large pizza and 15” extra large pizza. Domino’s is the only pizza company that guarantees your order will arrive within 30 minutes or they’ll give you a free Regular Pizza voucher! That’s not all; Domino’s guarantees satisfaction! Your pizza is guaranteed to be hot, fresh, and great tasting when it arrives at your doorstep, otherwise they’ll replace your order or refund your money! Domino’s also guarantees you’ll receive your Take-Away orders within 15 minutes or we’ll give you a free Personal Pizza voucher. You can also customize your pizza. To order Domino’s Pizza delivery, visit Domino’s website. What makes Domino’s Pizza Unique? Top Secret Sauce – An aromatic blend of creamy, cheesy flavors with an unmistakable garlic zest! Sweet & Spicy Sauce – For those who like a bit of spice in their life! The international fast food pizza delivery corporation, Domino’s Pizza, is a renowned and popular choice amongst people for relishing their favorite fast food, the Pizza. Today, this huge franchise has a profound global impact and has more than 8,900 corporate and franchise stores in more than 65 countries. It all started in the year 1960, when two brothers named Tom and James Monaghan bought a small pizzeria in Michigan by the name of Dominick’s Pizza. They bought it for $500 and gave a down payment of $75. After 8 months, James quit and traded his shares with his brother for a second hand Volkswagen car. This led Tom to revitalize the image of the eating joint and name it Domino’s Pizza. 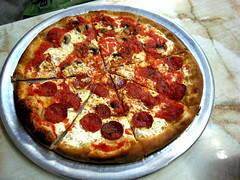 Sarpino’s pizzas are made from authentic ingredients, cheeses made from 100% real mozzarella and edam, fresh packed sauces using only vine-ripened tomatoes & a proprietary mix of savory Italian spices, & a choice of high-quality meats (no artificial fillers) & a variety of garden fresh vegetable toppings. Dough is hand kneaded each day in Italian tradition in every location. Free delivery with a minimum total order of $20. We also cater for functions and events. ERP charges applicable within CBD area. Delivery time is subjected to weather and traffic conditions. Sarpino’s is having a promotion, “Buy 1 Get 1 Free” offers. FREE 1.5ltr of Coco Cola with every purchase over $40. * Not valid with Buy One Get One Free & Combo Meals Offer. Additional parmesan cheese at $0.30/pkt and chilli flakes @$0.10/pkt upon request.Sarpino’s Pizzaeria delivery hotline number: 6262 6767. Free delivery with a minimum total order of $20. We also cater for functions and events. Topped with Mozzarella, Edam, Feta, Cheddar & Parmesan Cheese. Sarpino’s was created in response to consumer demand for greater freshness, quality, authenticity & most of all variety in their fast food alternatives. In 1972, Sarpino’s founder Gerry Koutougos established his first full service restaurant in Victoria BC Canada. After years of providing authentic Italian & Mediterranean dishes through a number of successful full service restaurants, Gerry saw the opportunity to provide consumers around the world with these fresh authentic Italian dishes through take out and delivery restaurants. In researching the international fast food markets, it was clear that something was missing. So many “Italian” fast food restaurants were offering virtually the same single product – pizza; and in doing so using the lowest cost ingredients (hence lower quality). Observing this, Gerry was determined to set a higher standard! The new Twist ‘N’ Dunk pizza, which comes with 18 mini crusts topped with savoury Italian herbs. Twist them off and dunk them into cheddar cheese and Chacho’s nacho chips and enjoy a fun-filled meal for both you and your taste buds (valid till 1 Dec). Pizza Hut’s latest LunchXpress promotion promises to deliver set lunch at $8.5 in 15 minutes. This service is available from Mon-Fri 11am-2:30pm.